Over 60% of our clothing collections are free from harmful fluorocarbon compounds PFC. We have completely eradicated the use of long-chain fluorocarbon compounds (C8 PFCs) in our entire clothing collection since 2014, and from 2018, backpacks are included in this. Over 75% of the fabrics used are either bluesign® or Oeko-Tex® Standard 100 certified. 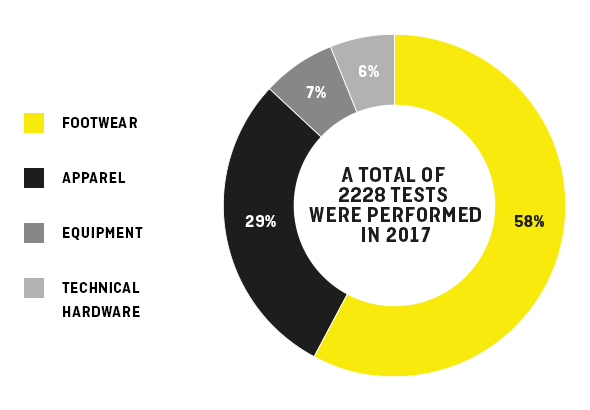 Every year, we carry out over 2000 tests with over 350 different materials in order to create products that are as pollutant free as possible. Health, safety and enjoying quality are our top priorities. Our systems for product safety and quality assurance are based on a comprehensive and rigorous verification process, which involves each stage of development and production. Products are therefore monitored/tested from the very beginning of the design process, to the moment they leave the warehouse. We consistently work towards avoiding harmful chemicals in our supply chain. We are partners with bluesign® and follow the well-known Restricted Substance Policy (RSP). All our suppliers must comply with the regulation regarding the use of certain substances. We strive to further reduce the use of harmful fluorocarbon compounds known as PFCs. In recent years, we have reduced not only the number of different products and substances, but also the number of suppliers. A clear collection allows us to further focus on chemical management and thus to increase efforts for environmentally friendly production. Our focus is on total transparency in our sustainability efforts, we want to seamlessly track and document our supply chain in terms of materials and production processes. This transparency will enable us to monitor and control the use of chemical substances throughout the production process. In collaboration with the Research Institute for Textile Industry for Chemistry and Textile Physics at the University of Innsbruck, we have developed our own Restricted Substances Policy. This is a list of chemicals that should be either completely eradicated from or strictly limited in our products and supply chain. The RSP has an exceptional status in the industry: It complies with bluesign® and exceeds the requirements of the OEKO-TEX® Standard 100. It excludes all eleven chemical compounds that Greenpeace classify as highly questionable. To start with, we test our products routinely for RSP compliance using independent, certified laboratories. This is the first and most important step in product safety and in eliminating harmful substances as far as possible in all SALEWA® branded products. In addition, we encourage our business partners to proactively inform themselves about innovations and improvements to their products. The same applies to existing certifications and material testing reports. Since 2011, we are partners with bluesign®. This is the highest industry standard requirement regarding the regulation of harmful chemicals, from the beginning of the supply chain through to the finished product. Bluesign® provides a list of safe chemicals with the so-called "Input Stream Management” (also to the chemical producers themselves) and thus ensures that the supply chain remains as clean as possible from the outset. The bluesign® system is based on the prevention principle and encourages the use of state-of-the-art technologies to detect chemicals in waste water and air. You can learn more about bluesign® and the company's unique approach here: www.bluesign.com. Since 2012, we also use OEKO-TEX® certified textiles for many of our products. 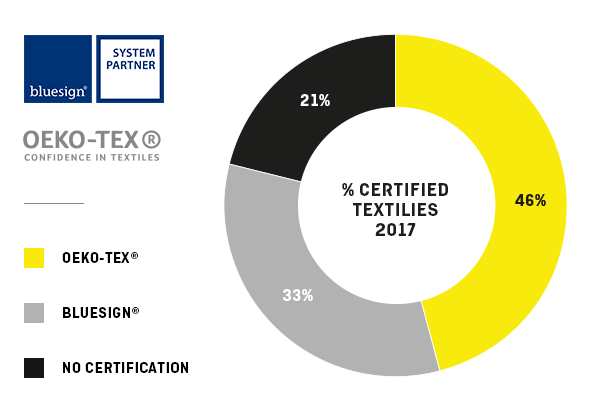 The OEKO-TEX® Standard 100 is a global, independent test and certification process for textile products at every stage of their manufacturing process. The standard contributes to high and effective product safety, from a customer's perspective. The test criteria and limits often surpass national and international standards. Our goal is to completely eradicate the use of PFCs in our products and manufacturing processes. Because we have a duty to protect our customers whilst ensuring the performance of our clothes. Which is why we constantly research for better or at least comparable technology. We have already carried out a lot of tests, however, unfortunately only the fluorinated surface treatments currently achieve the high level of water repellence that our high performance mountaineering products require. This performance is crucial for the health, safety and comfort of mountaineering athletes who are exposed to harsh weather conditions. However, SALEWA® are not deflected from their goals: to continuously reduce the use of PFCs, whilst working with partners and suppliers to find PFC-free solutions that do not compromise on performance. to participate in research projects and industry initiatives that underline and support this. We recognise our own responsibility and support various initiatives that are committed to eradicating the use of harmful chemicals in textile manufacturing. In this we are not alone and can rely on good old-fashioned teamwork. SALEWA® is currently working with other outdoor brands to eradicate PFCs entirely. Whilst we’re working hard on this, we are now taking steps to minimise the negative impact of these chemicals. • Our partners at bluesign® and Gore-Tex® are researching powerful and PFC-free alternatives intensively. We are making the PFC problem more and more the focal point of our supply chain. • Several groups within the outdoor industry (European Outdoor Group EOG and BSI) actively participate and support research initiatives for PFC-free solutions. • We strongly recommend that you publish your waste water test results on international platforms such as IPE. Sharing relevant data is a crucial step towards greater publicity, transparency and reliability. Anyone can help speed up the eradication of PFCs. Impregnations containing PFCs are known for their outstanding performance: They are highly water repellent and therefore support high water vapour permeability (also known as breathability). Which is why we use them in our most efficient products, especially the mountain sports sector. This performance is not essential in all fields, for example, less demanding day trips in moderate conditions. In these cases, there are powerful and environmentally friendly alternatives that are PFC-free. So when you’re preparing for your next adventure, think about the product requirements before you buy. Choose a PFC-free product whenever possible, we have a lot of choice, as 60% of our products are PFC-free. Part of our transparency promise, is that our customers are able to make well-informed decisions. The information on labels, washing instructions and above all, the sales talk in stores, are essential for us. We want to further improve in this area this coming season.